A patent is a professional accomplishment and should be shared on your LinkedIn profile. If you are an inventor with patents to your name, the Patents section is the place to showcase your work. If you have the Patents section already added to your profile, simply scroll to it and click the pencil (edit) icon to enter into edit mode, then go to Step 5. If you don’t have the Patents section added to your profile yet, scroll below the Contact Information section at the top part of your profile and click the View More link to see a full list of sections to add. In the Patents section, click Add Patents. When clicked, the Patents section appears on your profile. In the Patent Office field, select the appropriate Patent Office from the drop-down list. Under Status, select Patent Issued or Patent Pending. Type in the Patent/Application Number. In the Patent Title field, enter the name of the patent. In the Inventor(s) field, add any additional inventors by placing your cursor over +Add Another Inventor and typing a name. To choose a name from a drop-down list, additional inventors must be first-degree connections on LinkedIn. If they aren’t first-degree connections, you can still add their names, but they won’t have a profile dynamically linked. The additional inventors have the opportunity to add the patent to their profiles (or not). The inventors’ names will not be linked to the patent, and the patent will not show up on the inventors’ profiles, until they approve. Your name is always listed first when you add a patent to your profile. To rearrange the additional inventor names simply, click a name and drag it into the desired order within edit mode. If you remove the patent after additional inventors added it to their profiles, the patent will remain on their profiles. In the Issue/Filing Date field, choose the month, day, and year from the drop-down lists. In the Patent URL field, add the patent’s URL where more information on this patent can be found. 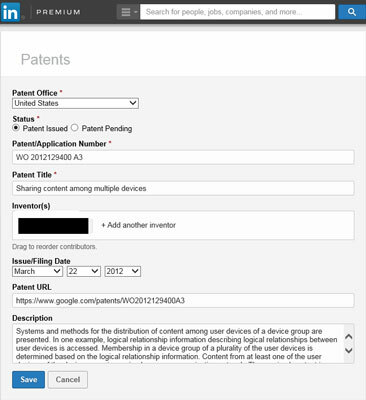 In the Description field, provide some detail around the patent. This is a great place to add more description about your patent, and you can even provide a brief sample from the patent itself. Adding a patent to the Patents section.